So recently while working on some code, I realized that I have not yet ventured into the field of Unit Tests and TDD. I had read about it plenty but never had got an opportunity to work on it. Test Driven Development (TDD) consists of writing the test cases before you write your code. It mainly consist of 3 factors: Red, Green and Refactor. Red indicates writing of a test case which will always fail, mainly because of the fact that the functionality for passing the test has not yet been written. 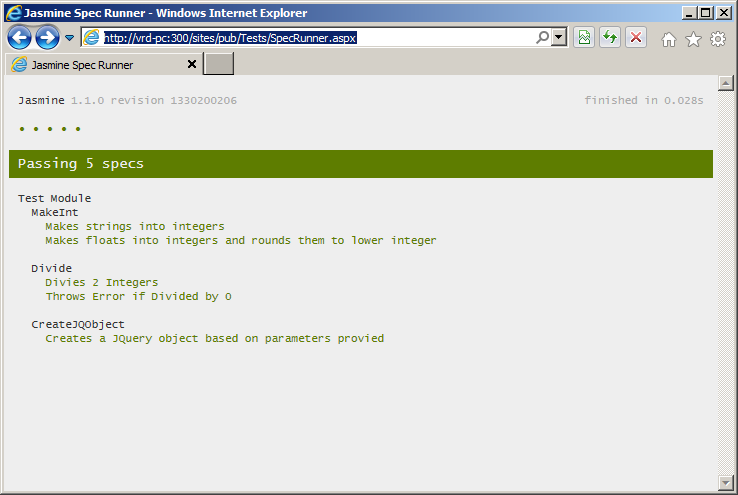 Next, Green indicates the creation of the functionality which will pass the test. And finally, Refactor indicates the re-modelling of your code to make it more efficient and performance friendly. As I mentioned before, the good thing about Jasmine is that you can use it as standalone framework without making much configuration settings. It completely runs in the browser and presents a very rich and informative UI when it comes to indicating whether a test has passed or failed. 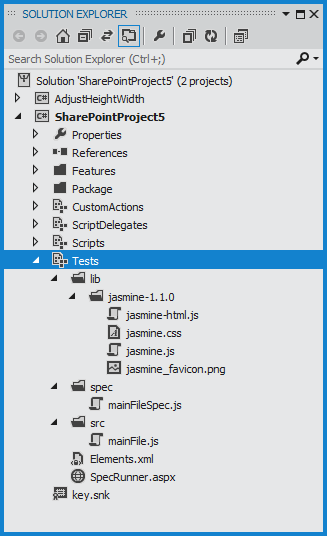 Now, the Jasmine framework requires some basic JS and html files to run the tests and display the results. The jasmine.js file does all the heavy lifting.It contains the code of the testing framework. The jasmine-html.js, jasmine.css and the SpecRunner.aspx page all work in the presentation layer and provide a nice rich UI to display the result of the tests. This file contains 3 functions. MakeInt converts a value to a integer with radix 10. Divide returns the first number divided by the second number. It throws an error is the second number is 0. CreateJQObject creates and returns a jQuery object with the the specified HTML tag, is and class. Now lets have a loot at the mainFileSpec.js file, which we will be using to test the functions defined in the previous file. 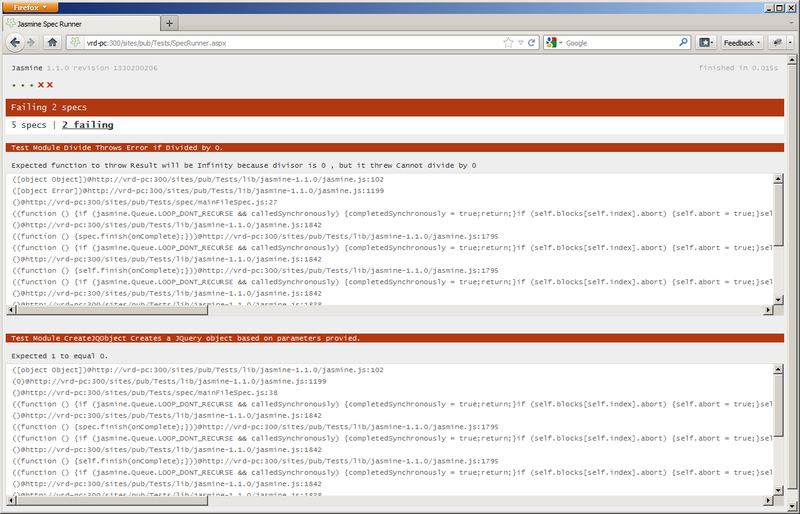 This test will now fail because the length of the jQuery object will be 1 and the test expects it to be 0. This test will also fail because the test is expecting one error but the code will throw another kind of error. So as you can see, if the test fails we are presented with the functions which are failing, their expected and actual values and the execution queue which caused the error. Does this create an XML report to be used in continuous integration like jenkins? I need your help. We need to generate an xml report with this to be used in jenkins.